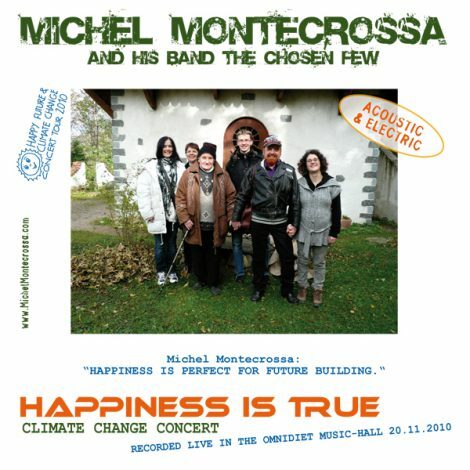 The ‘Happiness Is True’ Climate Change Concert, released by Mira Sound Germany as double Audio-CD and DVD is Michel Montecrossa’s 21st climate change concert of the Happy Future and Climate Change Concert Tour 2010. Performed in the Omnidiet Music-Hall the concert presents 28 poetic acoustic ballads, cyberrock and dance-electronica songs including the dance-electronica title song ‘Happiness Is True ‘, the rockin’ ‘Girl Encounter Rock ‘, the cyber-metallic ‘I Found Them All Drunk Again ‘ and great acoustic ballads like ‘I Am A Happy Man ‘, ‘It’s The Ball ‘, ‘No Slump In Love ‘, ‘Talkin’ Future World ‘, ‘We Are Singers Three ‘ and ‘Birth In A Cathedral ‘. Mirakali and Diana Antara contribute great songs like ‘Heroes Of The New World ‘ and ‘Earth Experience ‘. New: Click on the audiolinks in this post to listen online (after a few seconds) to the tracks – begin here ‘Happiness Is True and join the party! 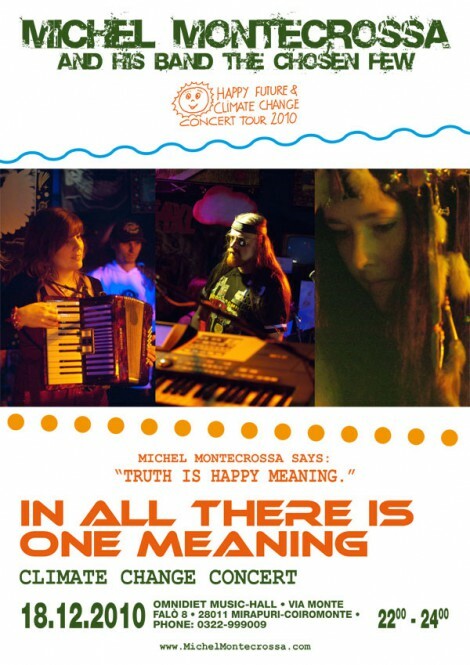 Michel Montecrossa’s ‘Happiness Is True’ Climate Change Concert wird von Mira Sound Germany als Doppel Audio-CD and DVD veröffentlicht und ist das 21. Cyberrock and Dance-Electronica Concert seiner ganzjährigen Happy Future and Climate Change Concert Tour 2010. Das Album ist die Live-Aufzeichnung von Michel Montecrossa’s gleichnamigen Konzerts in der Omnidiet Music Hall. Das Album präsentiert 28 poetische Akustik-Songs sowie Cyberrock und Dance-Electronica Tracks, mit dabei Highlights wie das Titellied ‘Happiness Is True ‘, Rock-Power mit’ ‘Girl Encounter Rock ‘, triumphaler Cyber-Metal von ‘I Found Them All Drunk Again ‘ und großartige Akustiksongs wie ‘I Am A Happy Man‘, ‘It’s The Ball‘, ‘No Slump In Love‘, ‘Talkin’ Future World‘, ‘We Are Singers Three‘ sowie ‘Birth In A Cathedral‘. Zu den Highlights dieses Albums gehören weiterhin ‘Heroes Of The New World‘ von Mirakali und ‘Earth Experience‘ von Diana Antara. Neu: Die anklickbaren Audiolinks in diesem Artikel kann man sich (nach wenigen Sekunden Ladezeit) direkt online anhören, hier ‘Happiness Is True gleich loslegen! The ‘Givin’ And Takin” Climate Change Concert, released by Mira Sound Germany as 6 CD-Box with 3 Audio-CDs and 3 DVDs is Michel Montecrossa’s 19th climate change concert of the Happy Future and Climate Change Concert Tour 2010. Performed in the Michel Montecrossa Rock Vision Diner the concert presents 25 acoustic ballads, cyberrock and dance-electronica songs including the title song ‘Givin’ and Takin’ ‘, the visionary ‘Arnika ‘, the powerful ‘My Government Is Happiness ‘, the thrilling ‘Cyberpunk #2 ‘, the inspirational ‘An Angel for You ‘ and the romantic band-version of ‘I Lead You ‘. Mirakali and Diana Antara contribute great songs like ‘Dreaming of a New World ‘ And ‘Planet of Love ‘. New: Click on the audiolinks to listen online (after a few seconds) to the tracks -begin here ‘Givin’ and Takin join the party! 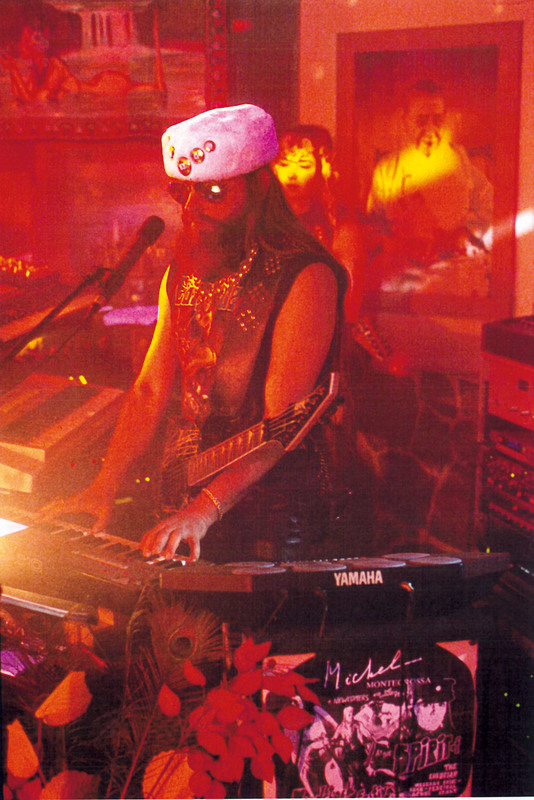 Michel Montecrossa’s ’Givin’ And Takin’ Climate Change Concert wird von Mira Sound Germany als 6 CD/DVD-Box veröffentlicht. 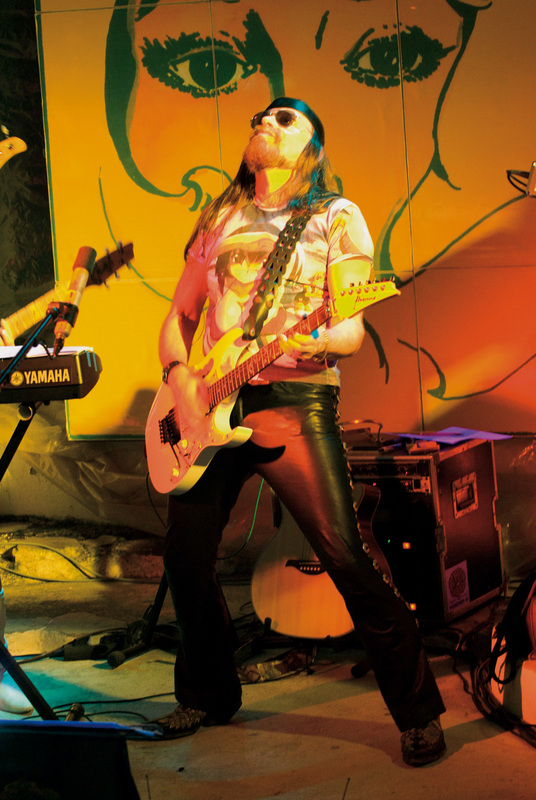 Das Album ist die Live-Aufzeichnung von Michel Montecrossa’s gleichnamigen Konzert im Michel Montecrossa Rock Vision Diner. Das Album präsentiert 25 poetische Acoustic-Songs sowie Cyberrock und Dance-Electronica Tracks, mit dabei der Titelsong ‘Givin’ and Takin’ ‘, das visionäre ‘Arnika ‘, Cyberrock-Power mit ‘My Government Is Happiness ‘, Dancefloor-Groove mit ‘Cyberpunk #2 ‘, das kunstvolle ‘An Angel for You ‘ sowie die Band-Version von ‘I Lead You ‘. Zu den Highlights dieses Albums gehören weiterhin Dreaming of a New World von Mirakali und ‘Planet of Love ‘ von Diana Antara. Neu: Die anklickbaren Audiolinks kann man sich (nach wenigen Sekunden Ladezeit) direkt online anhören, hier loslegen ‘Givin’ and Takin ! The ‘Dreamspace’ Climate Change Concert is Michel Montecrossa’s 18th cyberrock and dance-electronica concert of the Happy Future and Climate Change Concert Tour 2010. 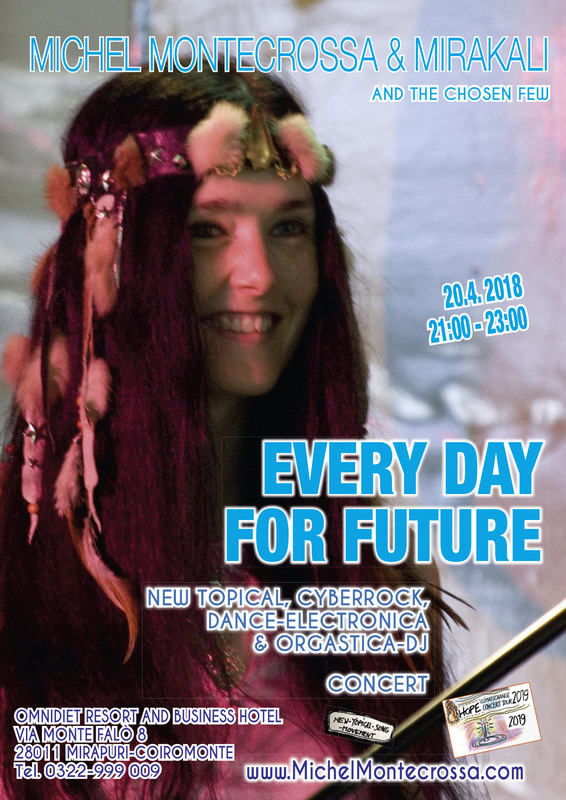 Performed in the Omnidiet Hall Of Fame during the ﻿‘DreamSpace Cyberrock & Dance-Electronica Music and Art Festival’ the concert presents 14 cyberrock and dance songs. Songs from the video: ‘Dream Space‘, ‘Quest For Love‘ (Mirakali), the incredible ‘Cybermoon #2‘, ‘Cosmic Wonder’ (Diana Antara), the 18 minutes psychedelic rave-killer-instrumental ‘Imagine‘, as well as ‘Name Of The Game‘ and the ‘People Orchestra‘ electronic-symphonic finale. Songliste des Videos: ‘Dream Space‘, ‘Quest For Love‘ (Mirakali), the incredible ‘Cybermoon #2‘, ‘Cosmic Wonder’ (Diana Antara), the 18 minutes psychedelic rave-killer-instrumental ‘Imagine‘, as well as ‘Name Of The Game‘ and the ‘People Orchestra‘ electronic-symphonic finale. 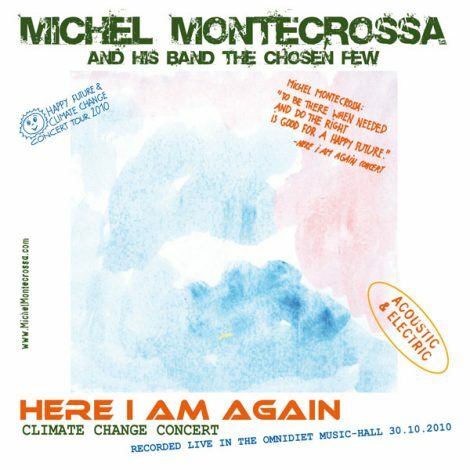 Watch here the preview video of Michel Montecrossa’s ‘Here I Am Again’ Climate Change Concert, released by Mira Sound Germany as double Audio-CD. ‘I’m On My New Way‘ ‘Here I Am Again‘, ‘Givin’ Is The Power Of Happiness‘, ‘Open Your Eyes Blues‘, ‘Hunt For Truth‘, ‘Damn It!‘ ‘Arnika‘ ‘Cyberrocker Ballad‘. The ‘Here I Am Again’ Climate Change Concert, released by Mira Sound Germany as double Audio-CD is Michel Montecrossa’s 20th climate change concert of the Happy Future and Climate Change Concert Tour 2010. Performed in the Omnidiet Music-Hall during the Mirapuri Literature Fest the concert presents 25 poetic acoustic ballads, cyberrock and dance-electronica songs including the title song ‘I’m On My New Way ‘ an alternate version of ‘Here I Am Again ‘, the topical ‘Givin’ Is The Power Of Happiness ‘, the cool ‘Open Your Eyes Blues ‘ and ‘Hunt For Truth ‘, the band-versions of ‘Damn It! ‘ and ‘Arnika ‘ and the outstanding electro-acoustic version of ‘Cyberrocker Ballad ‘. Mirakali and Diana Antara contribute great songs like ‘Flames Of Love ‘ and ‘Happy Love ‘. Zu den Highlights dieses Albums gehören weiterhin ‘Flames Of Love‘ von Mirakali und ‘Happy Love‘ von Diana Antara. Die neue Version des Michel Montecrossa Newsletter (﻿www.MichelMontecrossa.com﻿) bietet noch weitere Überraschungen. Eine davon ist die in den Newsletter integrierte Michel Montecrossa Foto Galerie (﻿ hier anklicken﻿) . Die Galerie bietet sowohl neue Bilder wie auch gut bekannte ‘Klassiker’. What: Michel Montecrossa and his band The Chosen Few will play on 18.12.2010 the ‘In All There Is One Meaning’ Climate Change Concert at the Omnidiet Music-Hall, the famous event-location of the Omnidiet Hotel in Mirapuri-Coiromonte, Italy. Mit dem ‘In All There Is One Meaning’ Climate Change Concert wird Michel Montecrossa am 18.12.2010 seine ‘Happy Future & Climate Change Concert Tour 2010‘in der Omnidiet Music Hall (28011 Mirapuri-Coiromonte, Nähe Lago Maggiore; www.Omnidiet-Hotel.com ) weiter fortsetzen. 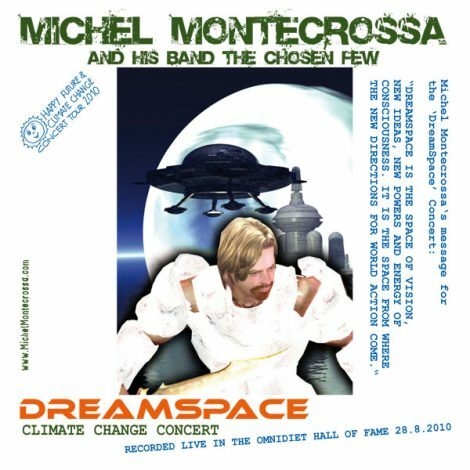 The ‘Dreamspace’ Climate Change Concert, released by Mira Sound Germany as Audio-CD and DVD is Michel Montecrossa’s 18th cyberrock and dance-electronica concert of the Happy Future and Climate Change Concert Tour 2010. Performed in the Omnidiet Hall Of Fame during the ‘DreamSpace CyberRock & Dance-Electronica Music and Art Festival in Mirapuri’ the concert presents 14 cyberrock and dance songs including the great dance-electronica opening ‘Dream Space ‘, the incredible ‘Cybermoon #2‘ and ‘Name Of The Game‘ as well as the 18 minutes psychedelic rave-killer-instrumental ‘Imagine‘ and the ‘People Orchestra‘ electronic-symphonic finale. Mirakali and Diana Antara contribute great songs like ‘Quest For Love‘ and ‘Cosmic Wonder‘. Das Album präsentiert 14 Cyberrock und Dance Songs, mit dabei der Titelsong ‘Dream Space ‘, ‘Cybermoon #2‘ ‘Name Of The Game‘ sowie das 18-minütige Psychedelic Rave-Killer-Instrumental ‘Imagine‘ und ‘People Orchestra‘ . Songs von Mirakali und Diana Antara auf diesem Album sind u.a. ‘Quest For Love‘ und ‘Cosmic Wonder‘. 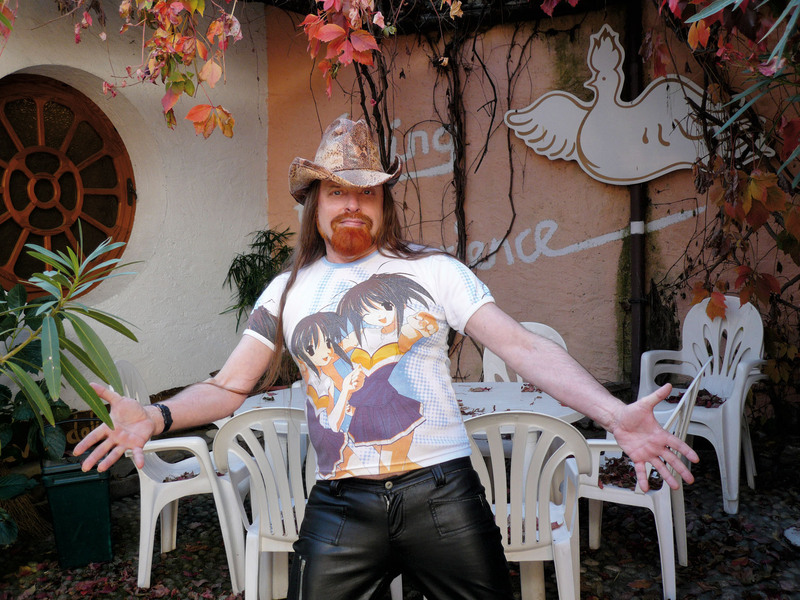 As you might have noticed the Michel Montecrossa Newsletter (www.MichelMontecrossa.com) has a new look & feel. You will enjoy new features like having the option to play various audiofiles on the newsletter using the integrated audio-player or play clickable audiofiles as mp3 files (open in a new Tab, a new window opens and the song starts playing). 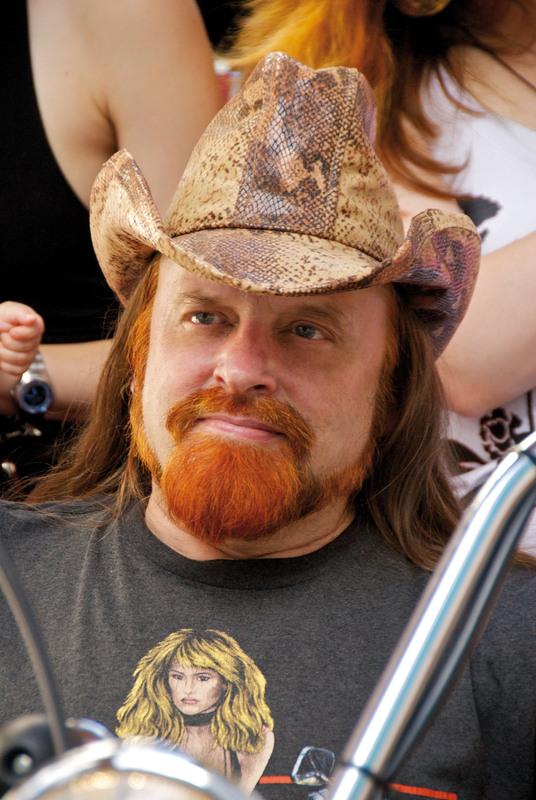 Der Michel Montecrossa Newsletter (﻿www.MichelMontecrossa.com﻿) präsentiert sich in neuer Form mit Tools wie dem integrierten Audio-Player, der die Audiofiles direkt abspielt oder mit anklickbaren Audiofiles, die sich auch online anhören lassen (ohne sie als Datei extra herunterzuladen; einfach in neuem Tab öffnen).